The Manchester United striker could feature on Monday night despite the fact that the Blues are still chasing his signature. Moyes could gamble on playing Rooney on Monday night. MANCHESTER UNITED MANAGER David Moyes has revealed that Wayne Rooney could start Monday’s Premier League showdown with Chelsea despite being regularly linked with a move to the London club. Rooney, who has been the subject of two failed bids from Chelsea boss Jose Mourinho, has been suffering from hamstring and shoulder injuries. But the 27-year-old came on as a second-half substitute in last weekend’s opening win at Swansea, setting up goals for Robin van Persie and Danny Welbeck. 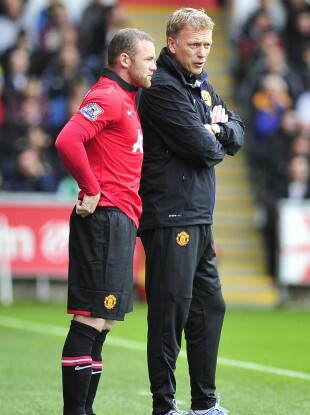 Wayne has recovered and has a good chance of starting,” Moyes said. Earlier Friday, Moyes reaffirmed United’s stance that Rooney will not be sold to Chelsea. Mourinho has suggested he will make a third bid for the England international following Monday’s game at Old Trafford. Email “Moyes considers starting Rooney against Chelsea ”. Feedback on “Moyes considers starting Rooney against Chelsea ”.